Foreign Minister Péter Szijjártó, on the sidelines of an informal meeting of European foreign ministers on Thursday, said the European Socialists planned channelised migration to Europe. Szijjártó labelled this as “dangerous” and something to be prevented by voters in the European parliamentary elections. 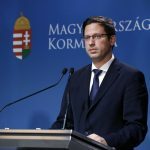 Szijjártó reacted to comments on Wednesday by commission vice-president Frans Timmermans, the left-wing’s EC presidential candidate, who commented on a European Commission policy paper he co-authored that addresses the issue of migration. The strengthening of migration trends can be prevented only if anti-migration forces gain a majority in the EP elections, he said. “This is a big debate taking place in the council of foreign ministers, too, because several governments in Europe have taken a pro-migration stand,” Szijjártó said. “At the same time, I believe that voters will be able to decide in the EP elections which direction Europe should follow on this matter,” he added. Szijjártó said the foreign ministers reviewed challenges affecting Europe such as “frozen conflicts” to the east and “crisis areas” to the south and south-east. “Unfortunately, no progress has been made regarding the crises that surround us to the south, neither in the Syrian nor the Libyan crises,” the minister said. “On top of that, taking together the migrants from sub-Saharan Africa arriving in North Africa and those in the Middle East, some 30-35 million people live in the direct vicinity of Europe who might decide at any point, due to their living conditions, to set off for Europe,” he added. In light of the above, Timmermans’ Wednesday remarks are especially alarming, he added. “We are clearly talking about Soros’s man, otherwise he would not have received Soros four times and the head of George Soros-funded organisations numerous times,” Szijjártó said. “He has made his plan clear: he wants to develop a dedicated channel, a new opportunity to bring migrants to Europe if pro-migration forces retain their majority in the EP and the European Commission,” he added. “This is very dangerous for Europe; the security risks of migration trends have been clear in recent years,” he added.